Curacao means blue skies, tropical temperatures whole year long, and bright blue and green colors of the Caribbean Sea. Curacao lays in the Leeward Antilles and has relatively constant temperature of 28°C (83.0 °F) throughout the year. The trade winds blow 95% of the time, bringing cooling during the day and warmth during the night. Curacao has a semi-arid savanna-like climate with a dry season from January to September and a wet season from October to December. Curacao is a stretched island: from northwest to southeast it is 64 kilometers (40 miles) long, and it is approximately 16 kilometers (10 miles) wide. The landscape of Curacao is slightly hilly with varying heights. Only the northwest of the island could be called explicitly hilly. The northern coast has rocky terrain and dangerous breakers. Strong currents and lack of beaches make it dangerous for swimming and diving. The southern coast is very different and offers remarkably calm waters. The coastline of Curacao features many bays and inlets, where you can find many beautiful sandy and pebbled beaches, many of them suitable for mooring. Willemstad, capital of Curacao, one of the richest cities in colonial architecture, was placed on the UNESCO World Heritage List in 1988. The city breathes a distinct atmosphere of culture and diversity. The historic centre of the city consists of two quarters: Punda and Otrobanda. They are separated by the St. Anna bay, an inlet that leads into the large natural harbor; they are connected to each other by the unique floating Queen Emma pontoon bridge. Both sections of the city provide visitors with duty-free shopping. Punda is the oldest part of the city with marvelous historic buildings (such as Penha building) and many lovely shops and bars. On the wharf there is lively floating market where you can buy fresh South-American fruit. Otrobanda is now newly renovated in Antillean style. Now the restored historic Fort Rif, restaurants, shops, ice cream parlors, apartments and the remarkable Kura Holanda, a meticulously restored colonial 65-building resort with romantic courtyards and exotic gardens form a new face of Otrobanda. Take a walk in the city, taste a delicious ice-cream and enjoy the astonishing colonial splendor. Caracas Bay Beach is a free local beach where you can swim, barbecue, snorkel, dive or even have a party. On the beach there are few cozy bars, too. Not far from the beach there are scuba-dive and surf schools, as well as a famous tugboat, a hidden gem with thousands beautiful tropical fish such as parrot fish, cowfish, angelfish, barracuda, and many more. The beach is located only a 5 minute walk from your villa on Curacao. The Caracas Bay in the evenings and mornings is filled with sporters: joggers, bikers, skaters and just people taking a leisurely walk. Also, there are some nice restaurants located directly on the bay, such as De Kleine Wereld (The Little World) and Snapper Seafood & Grill. Don’t forget to enjoy absolutely amazing sunsets! Vista Royal is the newer part of the neighborhood Jan Thiel. It is located along the sea on the south side of the island, and some call it the most beautiful neighborhood for a villa on Curacao. Great villa’s and resorts, fantastic views, lots of good restaurants and bars, such as the well-known Zanzibar, located on the beach, where you can taste freshly baked pizza’s, salads, delicious lunches and much more. Every Saturday there is live music where you can dance salsa and bachata. Another inviting place is restaurant Classics in the resort Livingstone, beautifully decorated in colonial style, with their own bakery, where every morning you can treat yourself to freshly baked bread and all kinds of cakes hot from the oven. You can go for a terrific hike in the salt planes of Jan Thiel, a beautiful nature reserve nearby. Don’t forget to take along your binoculars to watch birds and the pink flamingos! Jan Thiel is the older part of the neighborhood with many splendid spacious villas with mature tropical gardens, built in different architectural styles, which makes the neighborhood also interesting in terms of diversity. Your villa on Curacao “Carpe Diem” is located exactly between the old Jan Thiel and the relatively newer Vista Royal. It was built on fertile grounds of the former plantation Damasco. Spanish Water is a beautiful sheltered lagoon with an entrance to the Caribbean Sea. 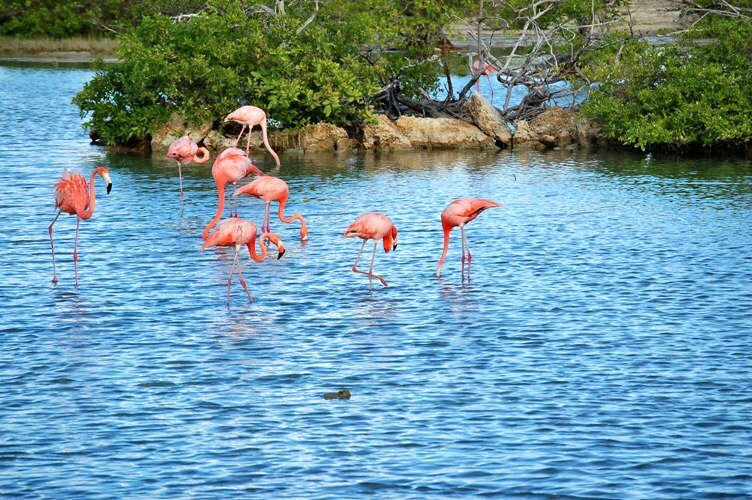 You will find here many tropical birds such as pelicans, frigate birds and many others. Here you can surf, sail and canoe. Around the lagoon there are all kinds of chic restaurants, one of which is The Boathouse, where you can enjoy fine European cuisine and an extensive collection of wines. During the daytime the view of the Spanish Water is unforgettable, but at night it is breathtaking! 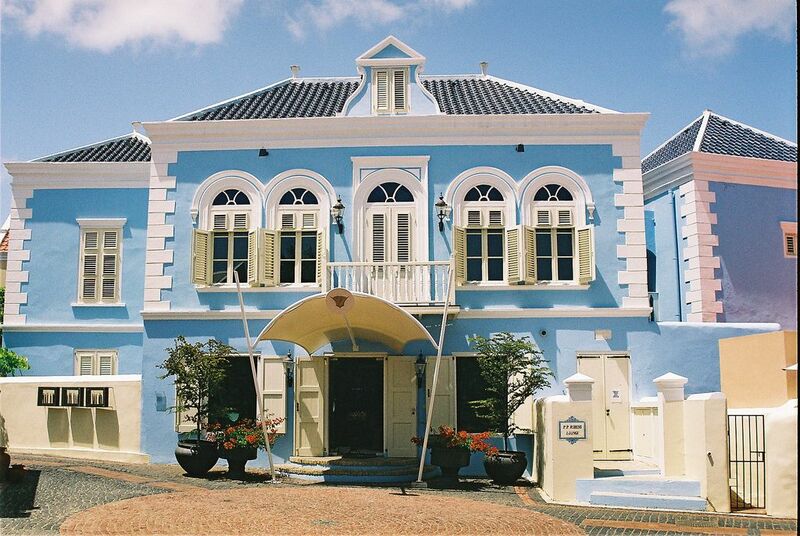 Landhuis Ascencion – The Ascension plantation was founded in 1672 and is located on the grounds of a former Indian village. The high location of the unique colonial home does not only serve as a utilization of the northeast trade-wind, but also has strategic interests, overlooking neighboring colonial homes, which was important in times of revolt or calamities. For this purpose an iron eye was placed in the top gable in which a torch could be burned. Once a month there is a guided tour. It starts with a religious service which follows by a music show and folklore. Landhuis Brakkeput – The plantation Brakkeput was built at the beginning of the 18th century. Brakkeput means a well with a brackish water. The plantation was used for raising cattle and to grow corn, beans, and fruit. In 1929 both the house and the land were sold to the Shell (Oil Company) due to the fact that plantation was generating insufficient goods to sustain itself. In 1985 country house Brakkeput Mei Mei was placed under the supervision of Stitching Monumentenzorg (foundation for the preservation and restoration of historic buildings) and from now on it functions as a party center and restaurant. 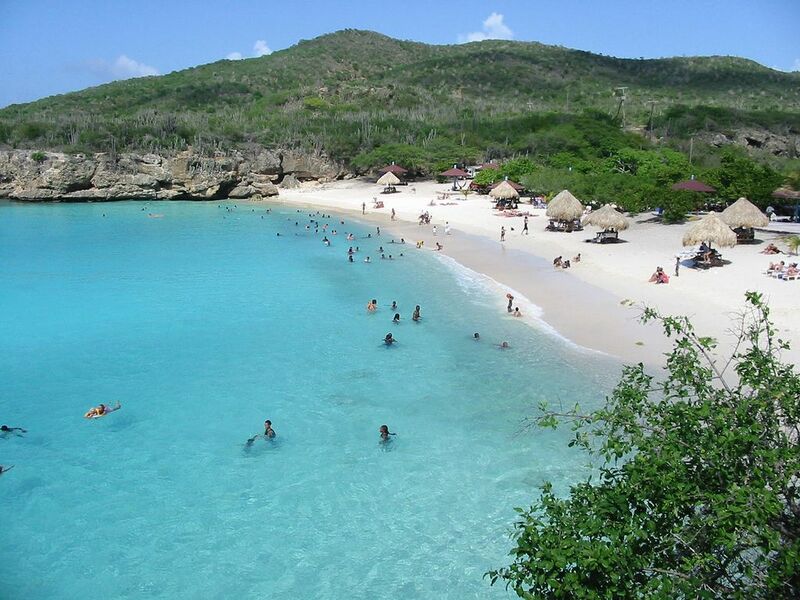 There are plenty of beaches in Curacao – from large sandy or pebbled beaches to small and secluded inlets. Almost all Curacao beaches are scattered along the sheltered and calm south western coast. The north coast can be interesting to see the dangerous breakers, sometimes meters high, to see the volcanic rocks and to feel almost stormy winds. Some of the beaches that are well-known and nearby your villa on Curacao are: Jan Thiel beach (Zanzibar), Caracas Bay beach, Mambo beach, and Seaquarium beach. Further away towards the West Point you will find beautiful beaches that are somewhat less crowded: Playa Kalki, Grote Knip, Kleine Knip, Playa Jeremi, Westpunt, Porto Marie and Cas Abou. Curacao is known for its coral reefs, used for scuba diving. The beaches on the south side contain many popular diving spots. An unusual feature of Curacao diving is that the sea floor drops steeply within a few hundred feet of the shore, and the reef can easily be reached without a boat. This drop-off is known as the “blue edge.” Curacao water world is really amazing!